Messenger Radio, hosted by Ray Sanders and Bob Nigh, recently interviewed Veggie Tales creators Phil Vischer and Mike Nawrocki. The following story is taken from excerpts from that radio interview. 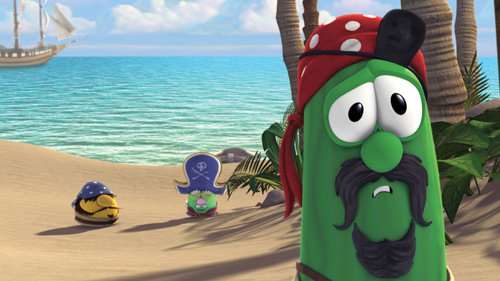 A gourd, a grape and a cucumber, who risk limbless life on the 17th Century high seas to save a princess, are the featured characters in a new Veggie Tales movie, “The Pirates Who Don’t Do Anything,” coming to movie theaters Jan. 11. Following on the heels of “Jonah-A Veggie Tales Movie,” released in 2002, the new story tells of heroism in the beloved Veggie Tales world. 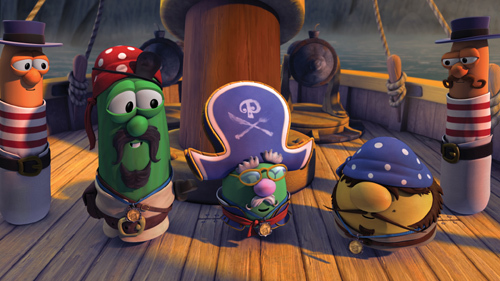 It follows the comic mis-adventures of three animated veggie pals who reluctantly set sail for adventure and discover that real heroes don’t have to be tall, strong or handsome . . . or even human. In fact, the three wannables learn to believe in themselves by believing in someone beyond themselves. The latest in a franchise that has sold more than 50 million DVDs/videos since its 1993 inception, “The Pirates Who Don’t Do Anything” continues the hit series’ values-based lessons in teaching kids what it really means to be a hero. The Veggie Tales series came about when co-founders Phil Vischer and Mike Nawrocki, a couple of college friends, teamed up to make animation history. Vischer said the idea for the new movie came out of a silly song that Nawrocki wrote more than 10 years ago. Vischer said Jonah got on the boat of the Pirates Who Don’t Do Anything. Vischer said as he looks at kids and back at his childhood, it seems as soon as they can walk, they are trying on capes, picking up swords and wanting to save somebody from something. “But then, as we get older, we lose that drive, and we watch other heroes-sports stars, pop stars and fake heroes on TV, because we’ve lost the ability to see ourselves as heroes,” he noted. In this film, a hero is defined as someone who does what’s right even when it’s really, really hard. Vischer said in creating the Veggie Tales videos, he and Nawrocki think about not only what kids think is funny, but also what they think is funny. “It’s been fun to see whole families involved in Veggie Tales,” Vischer commented. He told of a letter he received from a parent at a family reunion who put on a Veggie Tales video to keep the kids entertained, and by the end of the video, all 80 family members were crowded in the living room watching this kids’ video. Nawrocki said they are very careful about making the lesson in the videos understandable for young kids. “They can walk away knowing what the story was about and also have something concrete they can take away from the story,” Nawrocki said. Vischer said there is a misconception that all Veggie Tales videos are Bible stories. Vischer explained that “The Pirates Who Don’t Do Anything” is a parable. “It’s the equivalent of how Jesus taught when He wanted to explain something about God,” Vischer said. “He didn’t talk about God. He talked about the owner of a vineyard or a judge. It was His way of engaging the broader culture with a story, yet they may not have wanted to hear a lesson directly about God. He told it in a different way, and they could pick it up and discover it on their own pace. “So what we’re really doing with this movie is trying a different style of Christian movie making, telling a parable, a story that communicates a Christian message, but in a more subtle way-a sort of ‘For him who has ears to hear’ for the broader world. “We are so grateful to have men like them out there producing films like this,” said Ray Sanders, Messenger Radio host and executive editor of the Baptist Messenger. “I’ve heard that Walt Disney created films that children would love, but that parents would enjoy going to as well. I think Nawrocki and Vischer have mastered that. 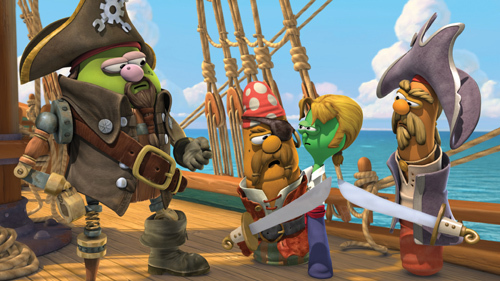 For more information on “The Pirates Who Don’t Do Anything,” visit veggiepirates.com Web site. You will find an 800 number for information about buying group tickets. Also, churches can call Universal to book whole theaters for viewing of the movie.